“I can’t hit a 1-iron, but I’ve proven countless times that I can hit a tree.” — Anon. “Have you got something against trees?” asks a tree surgeon from Dubai. The question puzzled me at first, but an hour’s perusal of the new Top 50 enlightened me. Four of the top five courses (and six of the top ten) are as treeless as the polar ice caps. The wind-blown machair at top-ranked Askernish Old supports a stubble of knee-high marram grass, but a South Uist horse thief will never hang there — nothing to hang him on, so to speak. Ditto for the dramatic dunes of Carne (No. 3), which support no vegetation taller than a garden gnome. Even Pittsburgh’s legendary Oakmont Country Club (No. 47), come to think of it, didn’t crack the Top 50 until its members chopped, sawed, toppled, bulldozed and ground up a few million board feet of shade trees in preparation for the 2007 U.S. Open. But to answer the tree doc’s question, no. We’ve got nothing against trees. Many of the Top 50 courses are extravagantly shaded, and no fewer than seven* are named for nature’s biggest nuisances: Oak Hill (No. 9), Cypress Point (No. 13), Pine Needles (No. 30), Castle Pines (No. 33), Calusa Pines (No. 46), Oakmont (No. 47) and Laurel Valley (No. 49). * Eight if the “Poipu” in Poipu Bay (No. 15) is Hawaiian for the arthritic, scarlet-blossomed view-hogger that ate my Pro V-1 four years ago. 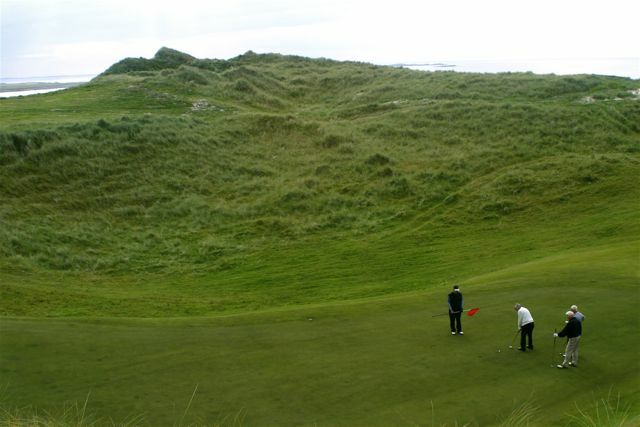 It’s just a fact that links courses are the most highly-regarded golf courses, and a true links has no, or hardly any, trees. * How else to explain Castle Stuart’s debut at No. 10, leapfrogging hundreds of parkland courses? Or St. Andrews Old at No. 16, despite a closing hole that is indistinguishable from the visitors’ parking lot. *Despite its name, the Pebble Beach Golf Links (No. 2) is not a true links. It is a cliffside course, the distinction being obvious to anyone who has ever sliced his tee shot on Pebble’s sixth hole. Personally, I’m about as pro-tree as they come. I have trees in my front yard and trees in my back yard, and if you see me discreetly raking my spiky sweet-gum balls under the neighbor’s fence, it’s because I want to share my arboreal bounty. Not sure if you’ve seen the latest college golf rankings, but Casey Martin’s team, the Oregon Ducks, are No. 1 in the nation. Two years ago, Oregon was a college golf outpost — about as far from the No. 1 ranking as you could get — and had been that way for decades. The team he took over had a very “Bad News Bears” vibe about it, and he’s completely turned it around. Whereas the program used to get one- and two-star recruits, now it’s getting five-star recruits — not an easy thing when you have to attract kids to rainy Eugene, as opposed to the sunny climates of California, Arizona, Florida and elsewhere. BTW, I have no skin in the game here. No business to promote or anything — just passing on a good story. Eugene may have long, wet, chilly winters, but the Ducks have got a great home course in Eugene Country Club. ECC hosted the NCAA golf championships some fifty years ago. (I know that because my older brother Tom lost to Tommy Aaron in the second or third round. Aaron stung the Garritys again, decades later, when a publisher mistakenly put his picture on the cover of Frank Beard’s Making the Turn, a book I had ghosted.) My impression of Eugene Country Club? Very green grass, lots of trees, perpetual dew.